Halloween is a very good excuse to eat cookies and candy. My dentist wouldn't agree with me, but otherwise she would be out of business. My current wife used to be in charge of this holiday department but now that she is "busy working"... somebody has to do the job, otherwise the kids would end with no Halloween treats. The fact that my child has moved out of the house is just collateral damage. Cookies are cookies, regardless of the child's presence or absence. The wife wanted to treat her colleagues at work with some sort of a Halloween treat. I suggested poisoned apples but, after a long thought she decided against. That is the reason of my baking this time. As usual, just to please the wife as I am a pleaser. 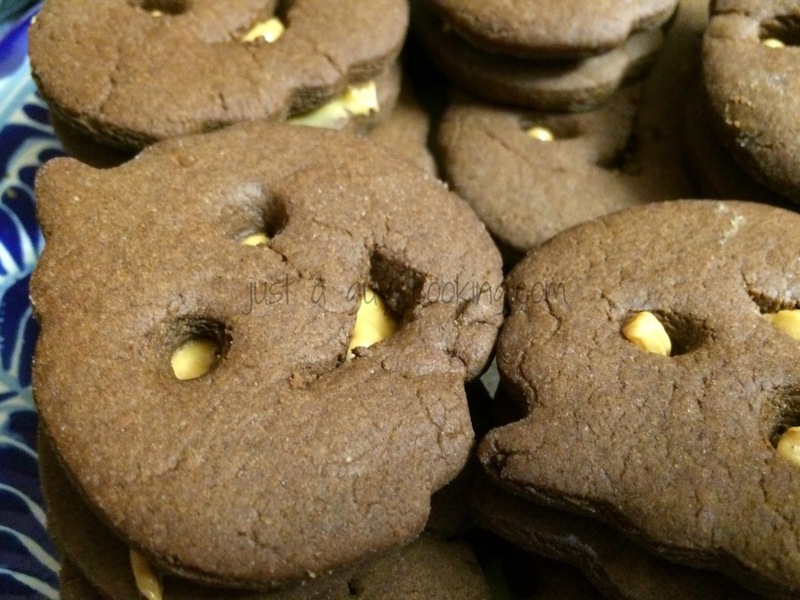 Cookies are fantastic and home made cookies are just on the top ten food items I like, so I decided to bake this mega delicious chocolate and peanut butter Jack-o-lantern shape cookies. You can't go wrong with the mix of chocolate and peanut butter. I baked them yesterday and I did 16 of them. Today there are 2 left... that should tell you enough. They are fantastic! 1. In a medium bowl we are going to mix our dry ingredients: whisk together the sifted flour, sifted cocoa powder, baking powder, baking soda, and salt. Reserve. 2. 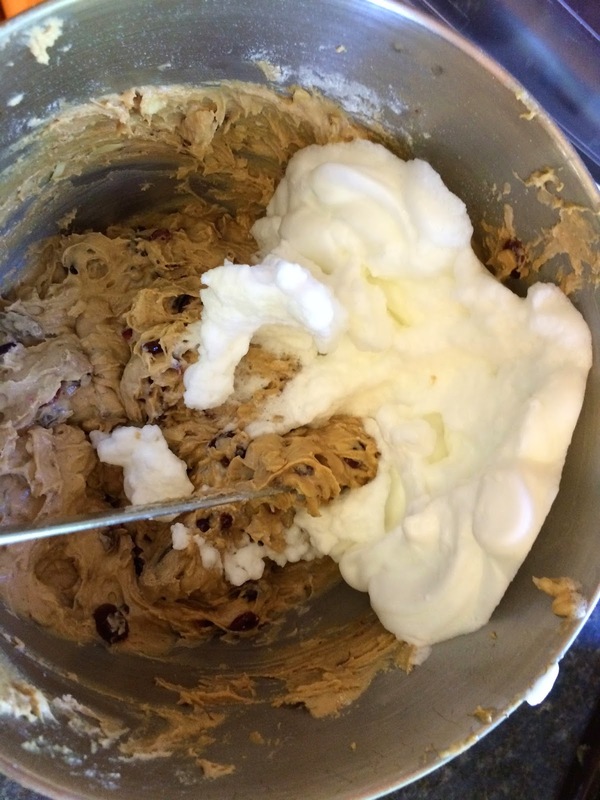 In a large bowl (I use my mixer’s), cream together butter and sugar until light, smooth and fluffy, about 3 minutes. Beat in egg and the vanilla extract. 4. Form dough into a ball, cover with plastic wrap and chill in refrigerator for at least one hour. 5. Adjust oven rack to middle position and preheat oven to 350°F. Line two baking sheets with parchment paper. 8. We are going to do the same with the remaining dough, but this second batch will have the jack-o-lantern faces. I have to admit: it sounds easier than it is -at least for me-. As I don’t have tinny cooking cutter shapes (eyes and mouth) I ended using the tip of a small funnel for the eyes and I cut the mouths with a pairing knife. They don’t look like a Martha Stewart’s confection but they look good enough for me. Transfer them to the second prepared baking sheet. Again…they are fragile so take your time. Obviously these are the top part of our cookies and we should have approx. 16 faces. Reserve. 9. Bake the first batch for 10 minutes or until the top looks dry on top. (I bake mine for 12 minutes because I like them crunchy). When ready, let them cool on the baking sheet for 15 minutes and then transfer them to a cooling rack (if you transfer right away they will brake and you will feel frustrated and cranky). 10. Now we are going to bake our second batch, exact same as the first batch. Follow the same instructions for the cooling method. Reserve. 11. Once the two sides have cooled perfectly (I waited half an hour), spread the flat side of our faceless cookies with about 1 teaspoon of the peanut butter. I really like the texture of the crunchy one, so that is what I recommend. Top them with the flat side down, so the two flat parts are the ones that touch the peanut butter. Press carefully the sandwich so a bit of the peanut butter comes out of the eye sockets and mouths. 12. Eat one and be strong, otherwise you will end eating half your cookies. I keep them in a Tupperware with paper towels so they keep dry and crispy, while they last…mine didn’t make it to Halloween. If so, feel sorry for the kids…and give them Oreos or something. Somehow people associate cake with kids...I don't. A grownup has as much right as any kid to eat cake -or even more right-. In the other hand people associate alcohol with grownups...and I agree. Kids are cute, at a distance, but a kid and alcohol does not mix. Sorry kids. And once we are debunking urban myths, I would like to talk about food and alcohol. Some people (let's call them weirdos) are convinced that the only wine, rum, cherry, etc...that is to be used in the kitchen MUST be of lower quality -cheap-. I totally disagree. To me drinking a good wine is as pleasant as tasting it on a dish. Cheap wine on a dish equals cheap flavor. Not a good thing. 3/4 Cup chopped and toasted almonds. 1. Combine cranberries, raisins and the whiskey in a metal or glass bowl and add the lemon and orange zest. 2. Mix well the cranberry-raisin mix and cover with plastic wrap (tight) and leave it room temperature overnight. You can drink couple of glasses of whiskey just because you deserve it. 3. Cream the butter with the brown sugar together until it becomes a soft, pale color mix. 5. Turn on the oven to 375˚F and butter and flour a 9 inch bunt pan. 6. 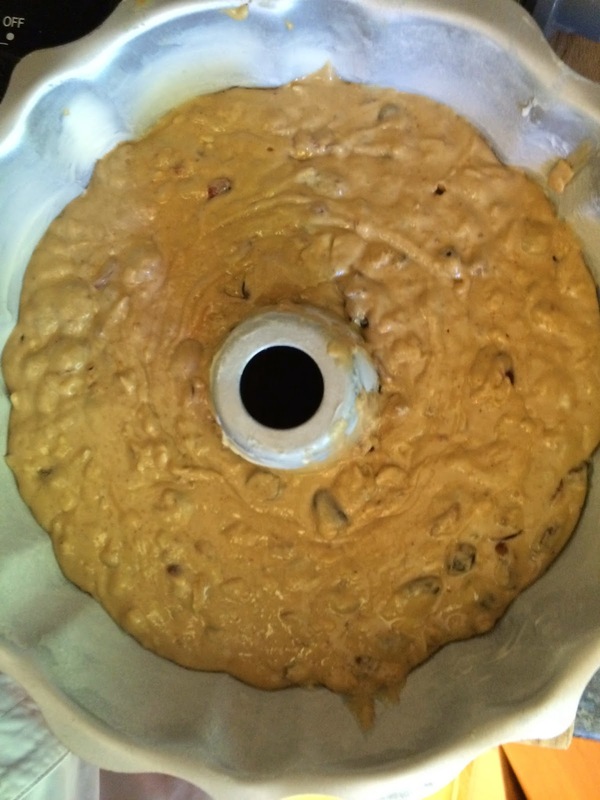 Incorporate, one by one the egg yolks to the butter mixture until incorporated. Reserve. 7. Mix the dry ingredients -sifted- : the flour, the baking powder, the salt and the cinnamon. 8. Toast the almonds and let them cool. 9. Incorporate the toasted almonds to your butter mix. Reserve. 12. 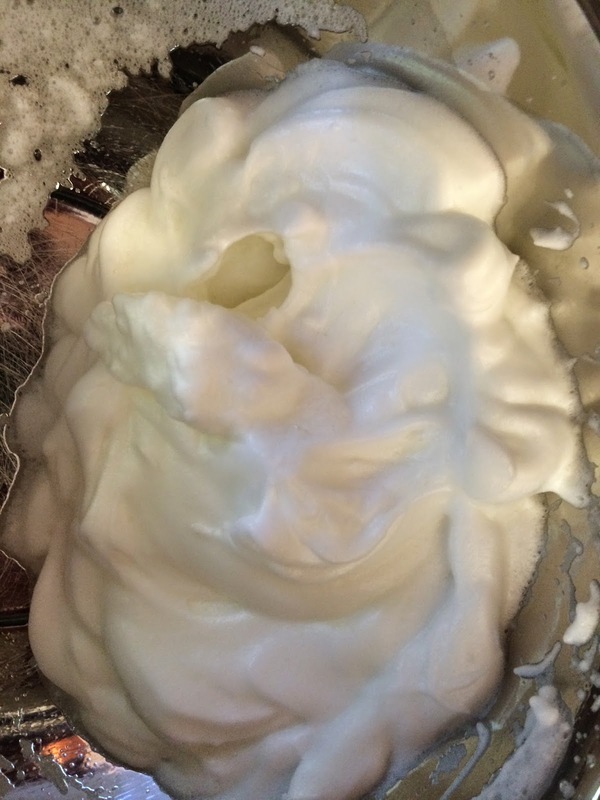 Incorporate the drunken berries to your dry mix and fold the egg whites. Don't over mix it ! 13. Pour the mix into the prepared pan. Shake it a bit to get rid of air bubbles. 14. Bake for 45 minutes (can go up to an hour) and you will know that the cake is ready when you insert a toothpick and comes out dry. 14. 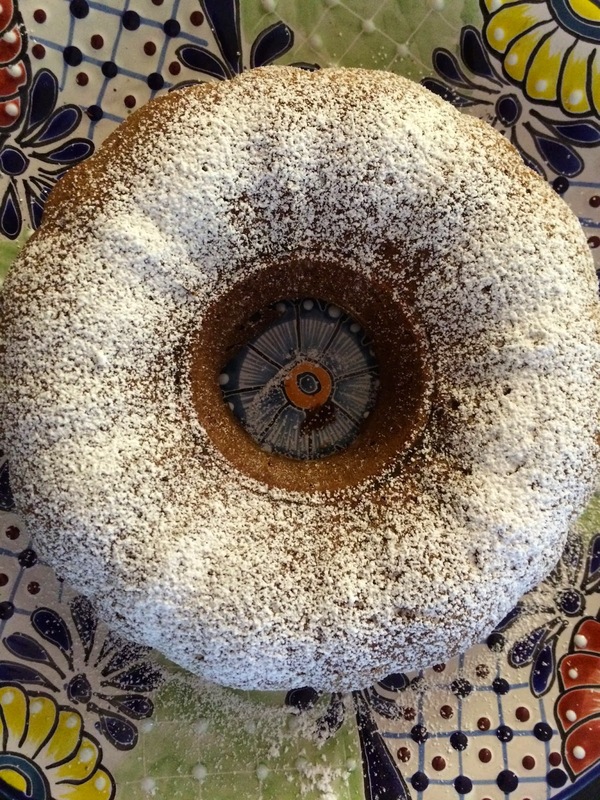 Allow the cake to cool in a wire rake. The house should smell fantastic! 15. Enjoy!...and make sure that you tell your kids that this cake is not for them. They will cry...then drink another whiskey and ignore them.